During periods of inactivity, perform preventive maintenance quarterly unless inspection reveals more frequent servicing is necessary. An inactive weapon is a weapon which has been stored in an arms room for a period of 90 days without use. The weapon may or may not have been assigned to an individual. Normal cleaning (PMCS) of an inactive weapon will be performed every 90 days. Should the unit armorer detect corrosion on a weapon prior to the end of the 90-day period, the PMCS should be performed immediately. Solid Film Lubricant (SFL) is the authorized touch up for the M16/M16A1 Rifle and may be used on up to one third of the exterior finish of the weapon. FOR CONUS USE ONLY: Solid Film Lubricant may be used as a touch up without limitation on the upper receiver and barrel assembly. This is to say that units which DO NOT fall under the category of Divisional Combat Units or rapid deployment type units may have up to 100% of the exterior surface of the Upper Receiver and Barrel Assembly protected with SFL. Prior to application of SFL the surface must be thoroughly clean and inspected for corrosion and/or damage. If corroded or damaged the part must be repaired or replaced prior to application of SFL. Continued use under combat conditions would result in an unprotected surface when the SFL wears off. This would result in a large light reflecting surface and accelerated deterioration of the unprotected surface. Therefore, Divisional Combat Units and units which fall under the definition of Rapid Deployment type must adhere to the limitation of NOT over 1/3 of their exterior surface covered by SFL. 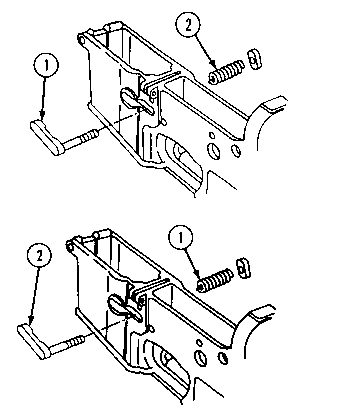 a. Disassemble as in operators manual Inspect tube (1) for bulges, dents, or damaged feeder lips (2). Inspect spring (3) and follower (4) for kinks or damage. 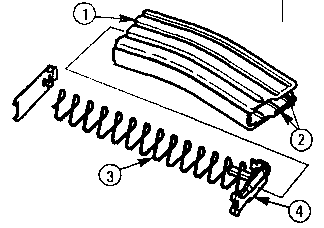 b. Reassemble magazine and check for binding during operation of follower (4). SH - Replace the magazine if any of these conditions exist. Item To Be Checked Or serviced larging handle as sembly and selector lever. 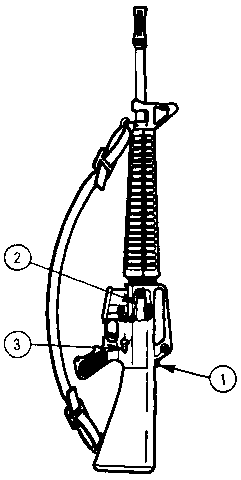 Automatic sear should have released hammer while holding trigger in the pulled position before releasing and pulling the trigger. With hammer in forward position, attempt to place the selector lever (3) in SAFE position using finger/thumb pressure only..